SNOW, a watch designed to elegantly solve the difficulty of checking the time while wearing skiing gloves and a thick jacket. 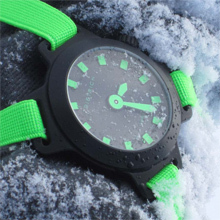 With its elastic strap attached to four separate lugs, the watch can be worn over the top of a ski/snowboard jacket. 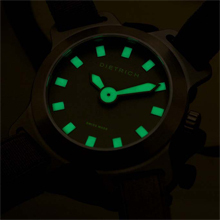 To emphasize readability in even the foggiest weather, this watch simply has two hands: hours and minutes, finished in a bright-green SuperLuminova. It comes in two versions: black case with black dial or grey case with grey dial. 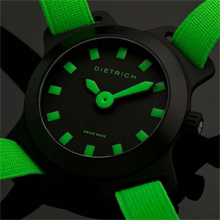 The watch comes with a set of two elastic straps of different colors and a military green travel pouch.